If you’ve listened to the news lately, you’ve probably heard that home prices are on the mend, big time. The latest piece of good news comes courtesy of S&P Dow Jones Indices, which released its S&P/Case-Shiller Home Price Indices report yesterday. It revealed that average home prices increased 8.6% and 9.3% for the 10- and 20-City Composite during the past 12 months ending in February. Both Composites recorded their highest annual gains since May 2006, back when home prices were reaching their peak during the previous boom. Phoenix, San Francisco, Vegas and Atlanta saw the largest year-over-year price increases, while Atlanta and Dallas exhibited the highest annual growth rates in the history of the indices, which date back to 1992 (10-City Composite) and 2001 (20-City Composite). There were a handful of metros that saw month-to-month declines in prices, but 10 metros continued to report double-digit year-over-year gains, including Phoenix (+23%), San Francisco (18.9%), and Las Vegas (17.6%). And the Composites are now back to their late-2003 levels. 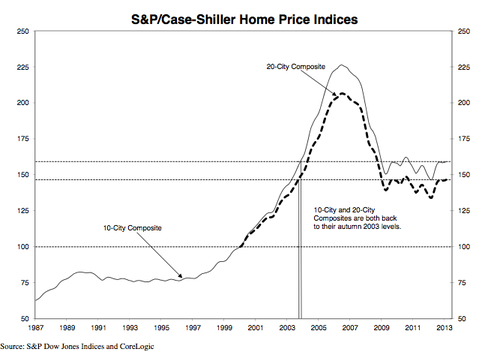 So why are home prices surging? Perhaps the biggest driver of higher home prices is the lack of distressed sales, or the shift from distressed to traditional sales. It seemed 2012 was the year of the short sale, and before short sales were all the rage, it was all about foreclosures. Now you’d be hard pressed to find either of those on the market. Because home prices have recovered tremendously over the past year or so, many would-be short sales are now conventional sales. And foreclosure sales have plummeted as more homeowners have managed to hold onto their homes thanks to a loan mod or refinance, or simply because inventory hasn’t been unloaded by banks (waiting for higher prices). Regardless, with traditional sales making up a greater share of overall home sales, prices are inevitably higher. In this same vein, there is not enough inventory to satisfy the growing demand of fanatical would-be home buyers. If we could go back in time, chances are 90% of the individuals looking to buy a home today likely had little interest to do so a year ago. They were probably still worried about home prices slipping lower. Unfortunately, this is a bubble mentality, and often leads to negative outcomes. At the same time, existing homeowners have caught on and realize that if they hold on a little bit longer, they too can take advantage of this rise in prices. Some may even be able to snag enough home equity to get back above water. That brings us to bidding wars, what with supply and demand so out of whack at the moment. You just can’t make a reasonable offer on a house anymore. Nowadays, your offer will be rivaled by a dozen others, all within a week of the home being listed on the market. This frenzied mentality has pushed home prices higher and higher, beyond rational levels. Of course, there’s a reason home prices have been allowed to climb higher without shutting too many people out. I’m talking about the ridiculously low mortgage rates on offer at the moment. From a mortgage payment standpoint, it makes a lot of sense to buy a home today. After all, you’ll pay next to nothing to finance your home purchase if you lock in a fixed-rate mortgage at today’s rates. You see, Americans are spending a lot less of their monthly income on mortgage payments, but many U.S. metros now have home price-to-income ratios above historic norms. So if you remove the low mortgage rates from the equation, the affordability picture changes considerably. Still, that hasn’t stopped Wall Street investors from scooping up oodles and oodles of properties on the cheap. These cash buyers, including private equity firm Blackstone, have been squeezing everyday buyers and first-time home buyers, making it extremely difficult for the latter to land an accepted offer. Their determination to get their hands on these properties in a certain timeframe at seemingly any cost is naturally causing home prices to rise. The goal is to own clusters of single-family homes in neighborhoods throughout the nation, which they plan to renovate and rent out, and eventually flip once home prices move even higher. This type of speculation is worrisome, and reminiscent of the previous housing boom that quickly went bust. It also explains why the rate of homeownership has dropped to the lowest level since the mid-1990s. These hedge funds and investor groups are reducing the housing stock by converting former homes into rental properties. So now entire neighborhoods are really just sprawling apartment complexes, at least in the eyes of the investors. The bad news is they’ll eventually unload them to everyday Joes at a premium, seeing that they’ll be able to control prices with all that inventory at their fingertips.